I’m married to Mark Lynn, & I’m a mom of 3: Zachary (born in 1997), Jessica (born in 2000), & Sophia (she was born in 2002, & in older posts, I may refer to her as by her nickname, Fia). I was 30, on March 16, 2004, when I had a brainstem stroke. My discharge papers from Cleveland Clinic state “basilar artery occlusion”, but no one knows why I had a stroke. However, the stroke caused blood flow to stop going to my pons, which “relays messages to the brain, controls arousal and regulates respiration & voluntary movement. I became “locked-in” for several months (I was unable to move for 3 months, or to speak for almost 10 years) & I had a trache, G-tube, & catheter. These are all gone now, & though I have double vision, I’m light sensitive, I have PBA, (no control of my emotions) & I’m in a wheelchair, if I’m held right, I can walk–despite being paralyzed on my left side, I can move my head & right arm, I can write, I can swallow any cut up food (even steak & finely crushed chips), & I can sip through a straw. It is truly a miracle that I do what I do, because according to my MRI, I shouldn’t be doing anything that I’m doing! This website records my progress since my stroke on March 16, 2004. The first year is such a struggle, as I accepted the way things are now, but my husband was so very optimistic. He pushed & helped me in every way he could, & still does. (At times, he expects things, & I think, “Are u kidding? Do u remember I had a brain injury, & it’s a miracle that I can do anything…yet, u want more?! ?”) But through his expectations, mixed w/sheer determination, faith, & prayer, made me find new heights & achieve more than was ever said to be possible. When I started writing on my blog, I avoided writing during any day that there was a “pity party” or deep depression. However, those days exist just as much, & are important—afterall, I was grieving a loss & struggling w/a dramatic life change! But I chose to silently deal w/those days, & publicly deal with the many other upbeat days! Life doesn’t need to end, just because things get tough! Before my stroke, I was a singer, dancer, tutor, & taught at a local scrapbook store. I loved to write letters & journal. Now, the website is like my journal! I write sporadically, but I write down about my recovery, & share my thoughts, & any news. I also post pictures & scrapbook pages that I’ve either had help making traditionally, or made on my own digitally. 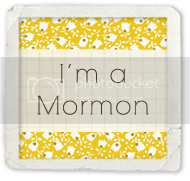 Despite my double vision, I’m a published digital scrapbooker, & despite typing w/only 1 finger, I’ve had an article published in the LDS church magazines, The Ensign & The Liahona. Additionally, because I have been blessed to do more (most people w/a stroke like mine can never do more than blink their eyes), I feel a certain responsibility to “speak out”, & am open to questions about my stroke, & in 2007, with my husband’s help, I “spoke” at an international doctor’s conference. Please feel free to email me anytime, & ask me anything! 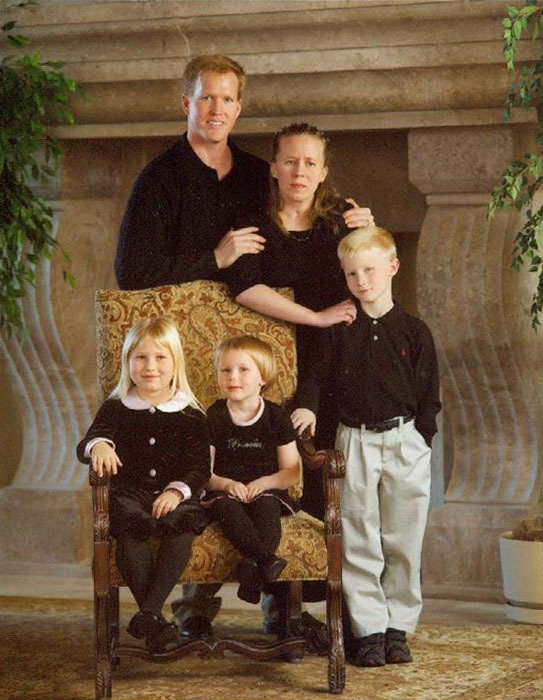 My family in 2003, before the stroke. 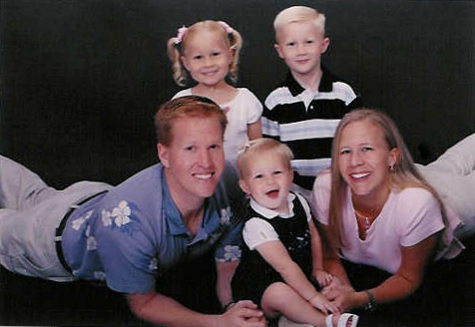 My family at Christmas 2005, almost two years after the stroke. Wow! I think you and your entire family are awesome! I was moved to tears and suddenly all the problems in my life seemed very small and trivial. Good luck to all of you for the future. God Bless! I just ran across you’re website because your video was suggested to me by youtube. I am 30 years old. I turned 18 on March 16th, 2004 and graduated high school a few months later. My very best friend (I consider her and introduce her as my sister) from high school on through until now has the same name as you..her name is Jennifer Lynn (or we say Jen, Jennie, or jennie lynn. My middle name is Ann. When reading through you’re story, I couldn’t help but to get chills because of all of the dates and name similarities. I am also married to Mark. lol. My husband’s name is Mark Spires jr. My mother’s parents both died from strokes and stroke complications and I just took care of my own mother for 8 months because she had 2 strokes. I am so so scared and terrified that I will end up having one at a young age as well. We’re there any warning signs that you can remember happening before the stroke happened? This is as current as it gets! If u get on my mailing list (email me your email, & say u want to join my blogs email list-my email adress is on here), I will notify u of when I post. This website also has links to my Instagram, Facebook, & semi-active you-tube channel. You and your beautiful family are in my thoughts and prayers! You have over come so much, you are so strong what a wonderful thing you are able to teach your babies. Mark is a real stand up guy staying by your side with love for you and your babies. I became disabled 3 years ago and my husband decided ot was something he couldn’t and wouldn’t be able to deal with. I would love to continue to follow your progress and continue to pray for your healing. God bless you and your beautiful family! Never give up! I don’t know what to say except wow! You’ve over come so many stumbling blocks or should I say “mountain blocks”. Your journey has been rife with trials most of us would have sucombed to. I know it’s because of your faith, Priesthood, and prayers of others that you’ve achieved things the medical field said you would never do again. You’re example puts me in my place. I became unable to work 2yrs ago. I’ve been unable to drive for a year now. I’ve lost my ability to do regular daily tasks. I’m in a wheelchair now most of the time. I give myself pity parties on a regular basis. Ha! Ha! I’m only 54yrs old now. Heavenly Father has blessed me greatly throughout my life. He helped me raise 4 beautiful children. All of whom were born under the Covenant of Eternal marriage. I grieve some days for the person I was when I attended BYU. Life’s trials have truly beat me down. I’ve lost me and I don’t know how to refurbish my spirit in order that I may tackle the new trials that have besieged me as of late. I feel weak and ashamed of myself that I’ve not been able to cope with the lot I’ve been given. I feel like I’m drowning, unable to stay afloat. I have no family except my kids. They each have their own life. All but my youngest have left home. They rarely if at all contact me or come to visit, 2 of them live in same city I do. My youngest is in 2nd yr of college. She’s become close friends with 2 of the girls she runs with in cross country and track. She’s going to be moving out next Aug to live with them in an apt off of campus. The University she attends is in same city we live in now, so she won’t be going far. I’m gonna be alone for the first time in my life and I’m scared that I won’t be able to live on my own. My apt is not handicap friendly. Most days I want to die because I am so very lonely and sad that my kids rarely spend time with me. I willingly sacrificed so very much when I raised the kids. Instead have showing gratitude they find fault with everything I do or not do. Some days I don’t want to wake up. I wish I’d die in my sleep. I’m ashamed that I can’t count my blessings. I debated whether or not to send this E-mail. I Feel deeply moved after watching your vlog, and reading your blog. I admire you and your tenacity! I feel so sad though that I’ve never had a husband like yours. I married a returned missionary and in the temple both marriages. Both of my exes chose alcohol, abuse, and abandonment in our time if being married and thereafter. They each chose to cheat on me as well. At the end of each marriage I mourned profoundly. I felt so much emotional pain that I wanted to die. I begged Heavenly Father to take the severe pain away as I needed to care for the children we had together, and He did! In the end they both chose to turn away from their kids and not be responsible and loving fathers and honor the Covenants they’d made with me and Heavenly Father. I’ve droned on and on. I am very sorry for that..I feel so lost and empty. There is no shame in how u feel. The 1st year after my stroke, I felt much like u…it took me 3 years to find anything to be grateful for, & it wasn’t until after #20 that I decided that it was ok to still be alive! But my husband kept up my blog that first year, so u don’t hear much about that! It was when I met (through email & an Ensign article) a man named Jack Rushton, who really understood the atonement, & made the best of his trials. His faith started me on the path that I am on now! I hope I can be the same kind of inspiration to u! I hope u are doing better! Thank you so much Jenny for sharing your story. Your faith, testimony, courage, love and trust of our savior, etc are truly an inspiration to me and everyone who has the privilege to know you or hear your story. Carissima Jenann tu sei una grande stella. Tu sei un miracolo vivente. God Bless You!